What an amazing vignette: at the foot of the elegant, invitingly top-lit stair, beyond the swirling white-robed figure, sits a figure in red boots and exotic hat. We may not know what scene is being portrayed in front of us here, but there is no doubt who painted it: THE WORK OF PETER FROM BORGO S SEPOLCRO is so beautifully lettered it could be carved. Yet this post – when displayed on my desktop screen – is even larger than the original, painted on its worm-eaten piece of timber in Urbino’s Ducal Palace. The whole paintings is less than two feet by three (58 x 81 cm, in new money). It is the Greatest Small Painting in the World. So said Kenneth Clark (in capital letters, it seems). The paintings of Piero (he from Borgo Sansepolcro, descendant of the matriarch Francesca), tended in the 20th century to attract such superlatives (you can read Aldous Huxley’s well-known superlative on another post). 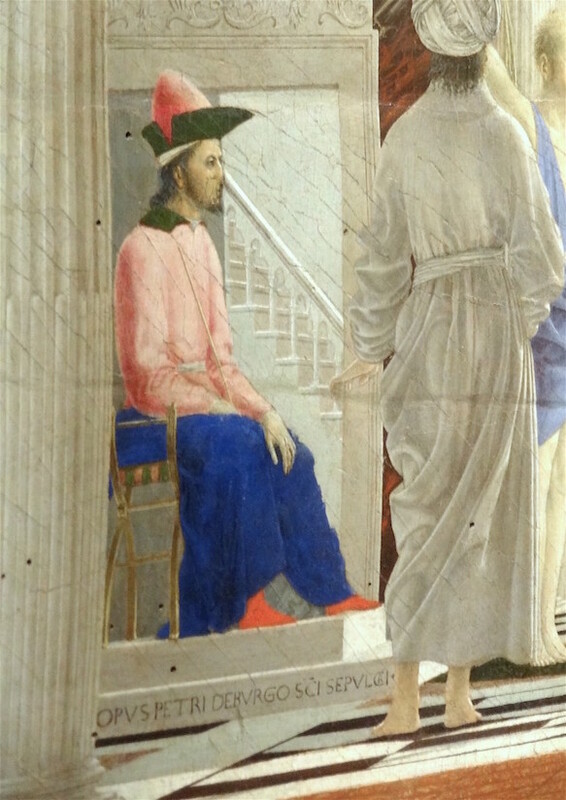 With neither of these judgements would we care to disagree – hence we are so looking forward to immersing ourselves in the World of Piero della Francesca in 2016 and hearing how our travellers judge such comments for themselves. 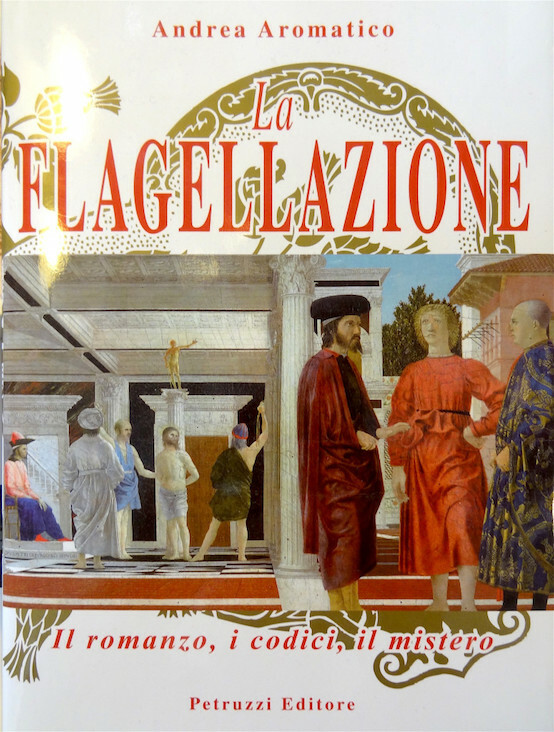 But this painting – whatever it portrays, and certainly there is some sado-masochistic goings-on under the gilded statue – is full of romance, hidden coded images and mystery; at least according to Andrea Aromatico whose book cover is also shown. But, having recently read Sir John Pope-Hennessy’s idea that it depicts The Dream of S. Jerome, I am easily converted away from the notion of it depicting the Flagellation of Christ (as all others say). Whatever else, this mysterious ‘double’ image deepens The Enigma of Piero (as Carlo Ginsburg calls it) which we will discuss when physically in Piero’s world in September 2016. According to Pope-Hennessy, “As a young man S. Jerome dreamed that he was flayed on divine order for reading pagan texts, and he himself later recounted this dream, in a celebrated letter to Eustochium, in terms that exactly correspond with the left-hand side of the panel.” Pope-Hennessy also reproduces an earlier picture by Sienese painter Matteo di Giovanni, which showed the subject recorded in Jerome’s letter – and the comparison is obvious. No one seems to support Pope-Hennessy. But also, no one has produced a different explanation for all the figures and their various groupings, their costumes and behaviour, which convinces me. I’m sure I’ll have found one by 2016. In fact, our Renaissance City tour missed a talk by an ‘art philosopher’ just by minutes, as we visited the Biblioteca Malatestiana in Cesena on our way home. Who knows how it might further have stirred our confused brains. Let me make a recommendation: abandon attempts at deciphering and interpretation. Come with us, in the footsteps of Piero himself next September, and simply enter into the extraordinary pictorial world he presents to us. This entry was posted in Cognoscenti. Bookmark the permalink.